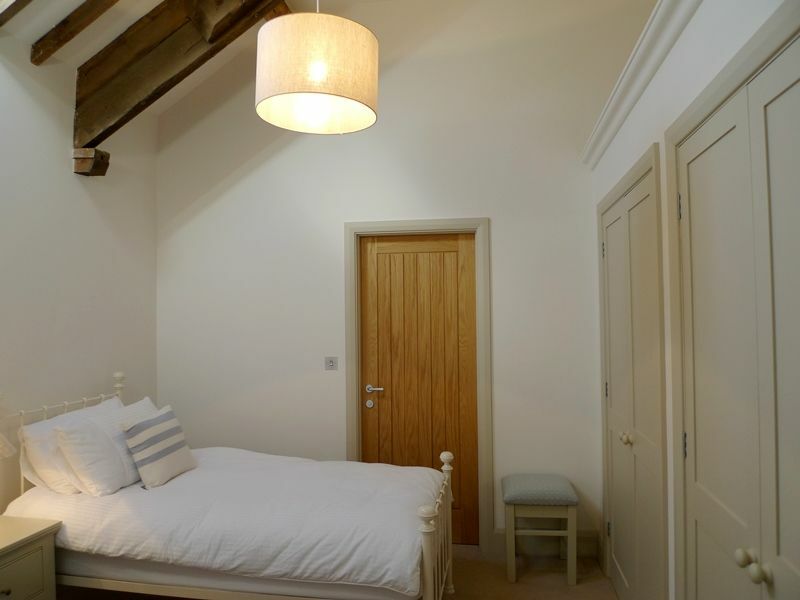 The barn has a wonderful light and airy feel to it, with all rooms generously sized. 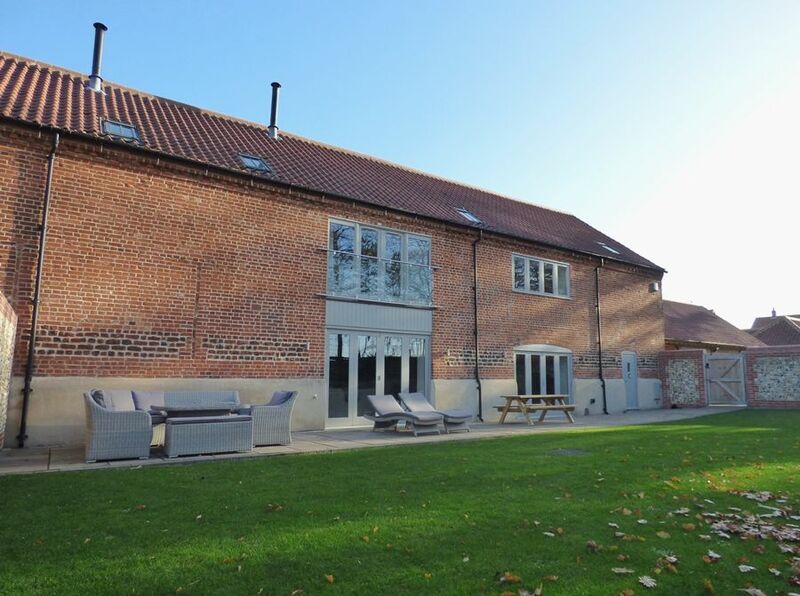 There is under-floor heating throughout the barn to ensure that it is warm and comfortable throughout the year. There's the advantage of a wireless audio system with speakers inside the barn, for guests to use their own smart phone/tablet and free Wi-Fi provided. There is also a land-line telephone which guests may use on an honesty box basis. Entrance hall: entrance hall with oak flooring throughout the ground floor. Boot Room/Utility: a useful room with space for coats and boots. There is a washing machine, tumble dryer and Belfast sink. Living Area: a stunning light and spacious living area with glazed double bi-fold doors along the length of the garden side opening onto the terrace. There's a bespoke stunning kitchen, oak dining table with 8 chairs and a comfortable sitting area around the wood-burning stove. Kitchen: a wonderful bespoke kitchen which has a large central island with 2 bar stools and a feature circular wooden section. It has been finished to an extremely high specification and designed to cater generously for 8 guests (and more) with an electric Aga range cooker and all new Miele integral appliances: 2 dishwashers, 2 fridges, 2 freezers, drinks chiller, microwave, integral coffee machine (taking Nespresso Pods). Dining area: overlooks the garden with fully glazed double bi-fold doors, there's a large oak dining table with 8 chairs. Sitting area: lovely sitting area which has two feature original flint stone walls, a wood-burning stove (logs are provided during your stay), three comfortable sofas, attractive wood and glass coffee table, wall-mounted digital TV and a DVD player. A wooden, gently curving staircase leads up from the living area to the landing. All of the bedrooms and their en-suite bath/shower rooms have high ceilings with original beams and have been luxuriously appointed and carefully furnished to ensure guests are comfortable. High quality bed linen and fluffy towels are provided. All of the en-suites have high specification bathroom fittings and contemporary tiles, with the modern heating and water system ensuring that there's always plenty of hot water available. Bedrooms 1 and 4 are accessed directly from the landing, with a separate door on the landing which leads to bedrooms 2 and 3. Bedroom 1: beautifully presented room with lovely open views across the garden and neighbouring fields. It has a king-size bed, bedside tables and lamps, wall-mounted TV, a chest of drawers, two built-in wardrobes and a chair. There is a large en-suite bathroom: with free-standing bath, separate walk-in shower with drencher head, twin vanity basins, WC and a heated towel rail. 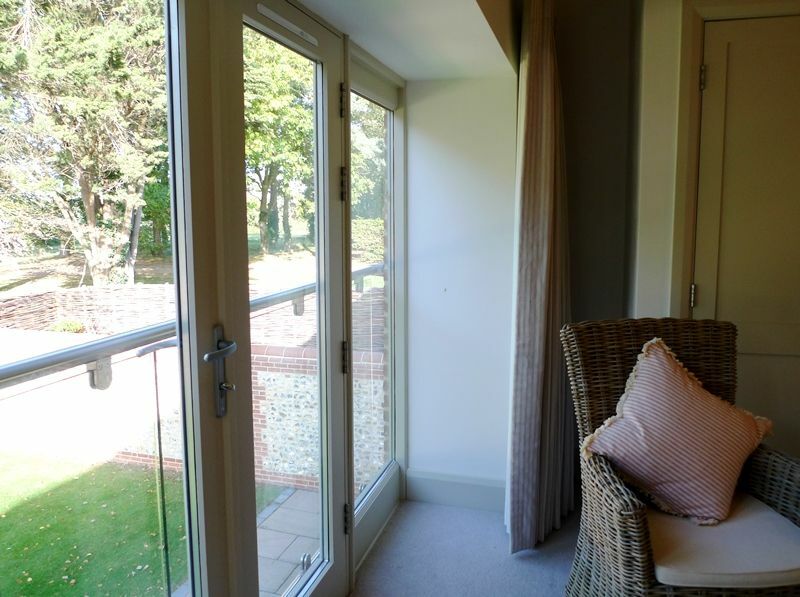 Bedroom 2: beautifully presented with a contemporary Juliet balcony to enjoy the lovely rural view. It has a double bed, bedside table and lamp, tall-boy, bedroom chair and built-in wardrobes. There is an en-suite shower room: with a large walk-in shower with drencher head, hand basin, WC and a heated towel rail. Bedroom 3: beautifully presented with a double bed, bedside tables and lamps, bedroom chair and a built-in wardrobe. There is an en-suite shower room: walk-in shower, hand basin, WC and a heated towel rail. Bedroom 4: another equally lovely room but this one has twin beds, bedside table and lamp and built-in wardrobes with shelving and hanging space. En-suite bathroom: walk-in shower, hand basin, WC and a heated towel rail. There is a hairdryer in each bedroom. 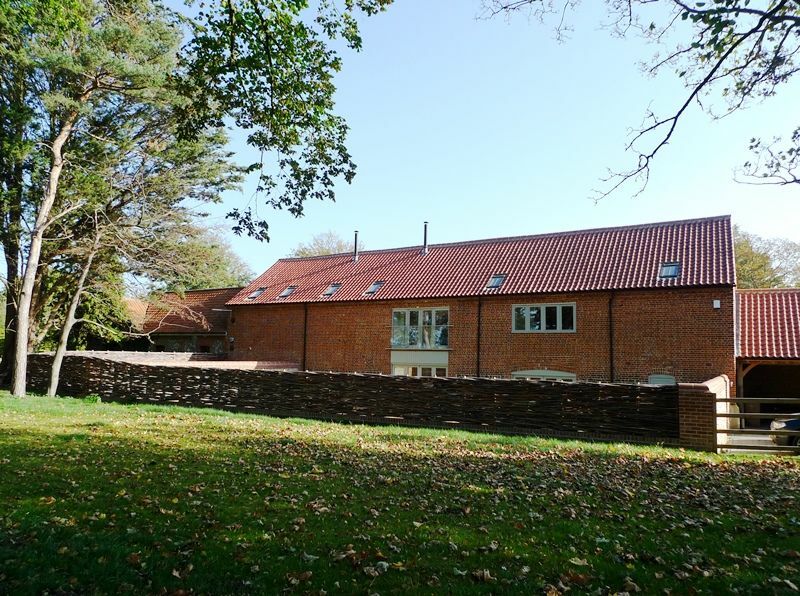 The barn is situated down a driveway off the coast road with ample parking space for 4 cars, entry to the barn is via a wooden gate into the garden. The west-facing garden is fully enclosed, with a flint stone wall and willow fencing. There is a paved terrace with outside furniture comprising of a bench, corner unit, armchair, two sun loungers, parasol and table and a gas barbecue, with the rest of the garden laid to lawn. 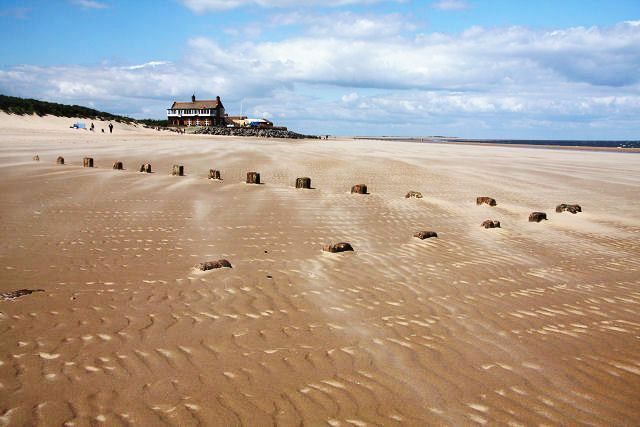 Conveniently located within a short walk of Brancaster beach, the Norfolk coastal path, the Royal West Norfolk golf club and the excellent Ship Inn. 10 out of 10 for cleanliness and garden Absolutely immaculate and the perfect house for entertaining. Everything had been thought of including an impressive array of board games. We will definitely return!! It's our fourth visit and we would come again. Obviously the owners have excellent taste. 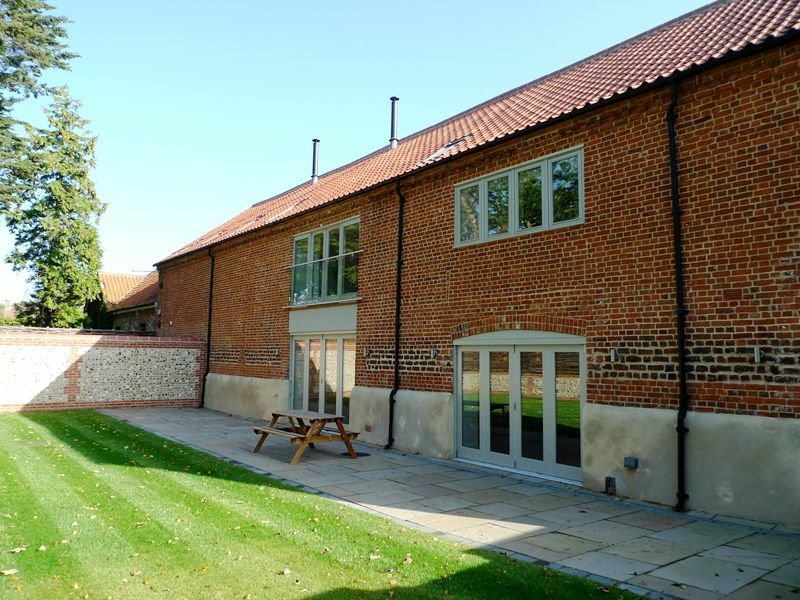 We had a wonderful time and thoroughly enjoyed staying at Manor Farm Barns. A very happy and memorable holiday. Feeling of space, tasteful fittings and furnishings, well equipped, great utility room, en suite bedrooms,it had pretty much everything. Good instructions for each bedroom/bathroom. I couldn't think of one thing we didn't like. A larger outside dining table would have been helpful plus a sun umbrella to provide shade from the midday sun - but we were there during a heatwave! This is the best cottage we have ever stayed in, really well stocked, gorgeous decor and furnishings. The position is perfect.